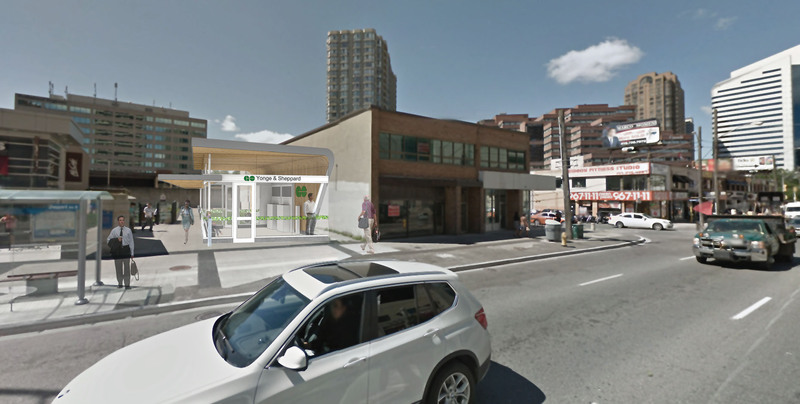 GO Transit: Yonge Sheppard Bus Shelter - Strasman Architects Inc. The shelter from was developed in response to the site conditions, program requirements, and GO branding initiatives. 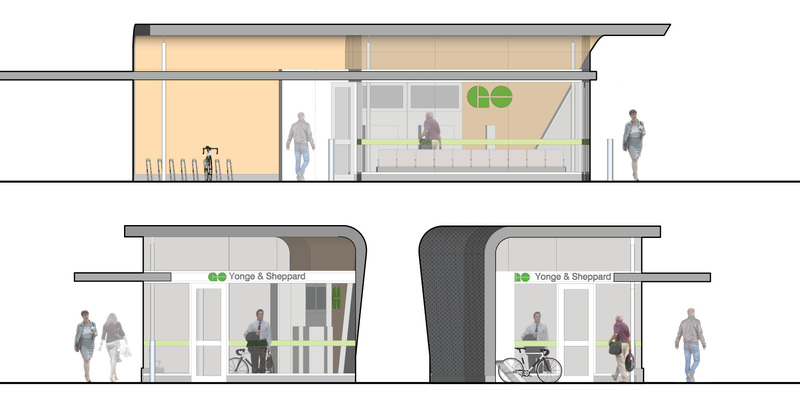 The shelter geometry contrasts against the surrounding structures to create a unique and distinct visual identity for GO Transit. The shelter canopy cantilevers over the sidewalk to enhance the shelter’s visual presence within the urban context and provides exterior weather protection for passengers waiting outside the shelter. 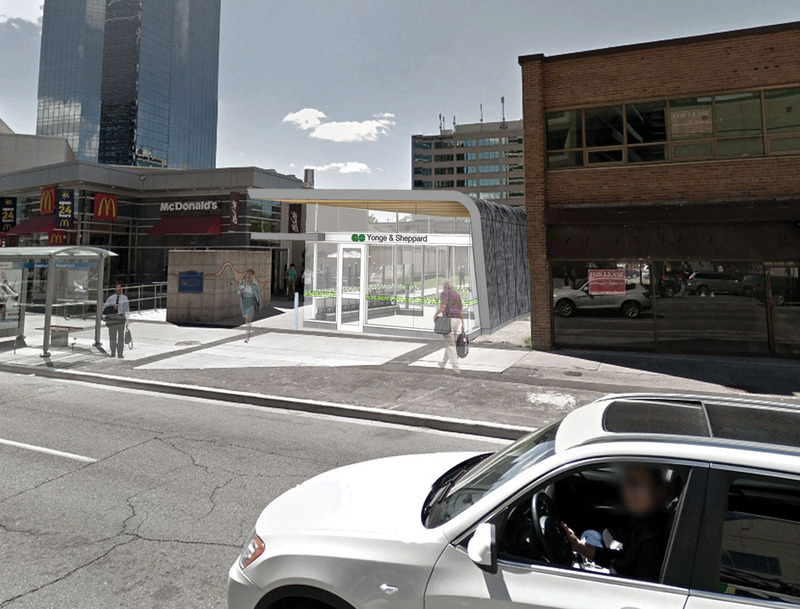 A secondary canopy marks the pedestrian walkway that extends from the shelter towards the Sheppard Subway Station. The curved gesture of the canopy roof form and the use of materials are consistent with GO branding. 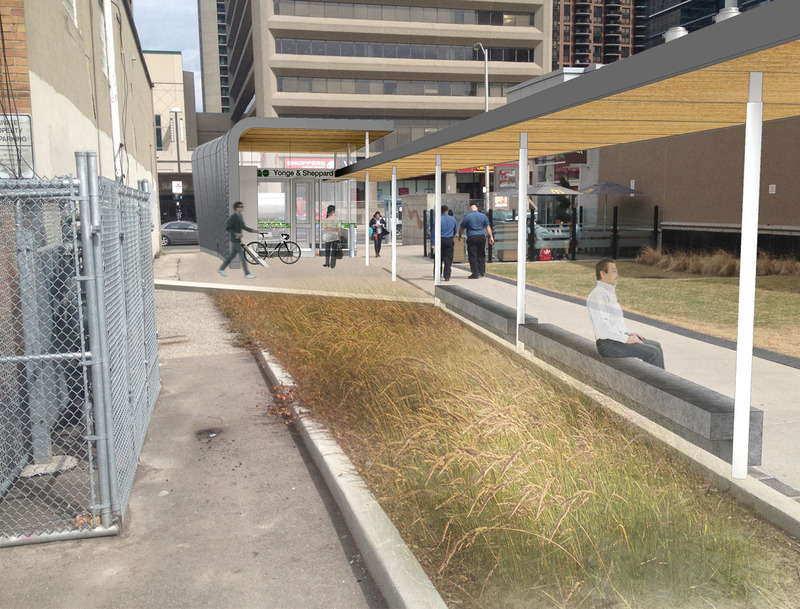 Wood is used on the underside of the canopy for improve pedestrian experience and comfort. Extensive glazing along the East-West face of the shelter allows for direct views to street and through the shelter for improved safety. The interior layout of the shelter accommodates bench seating (facing North for view of the bus), room for two Ticket Vending Machines (TVM), provision for a future TVM (or alternative), and display areas for potential route information and / or real-time digital schedule screens. Service closets are incorporated into the overall form of the structure.